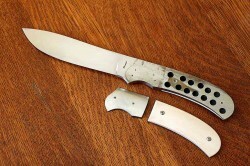 This is my version of the OSS thumb dagger. 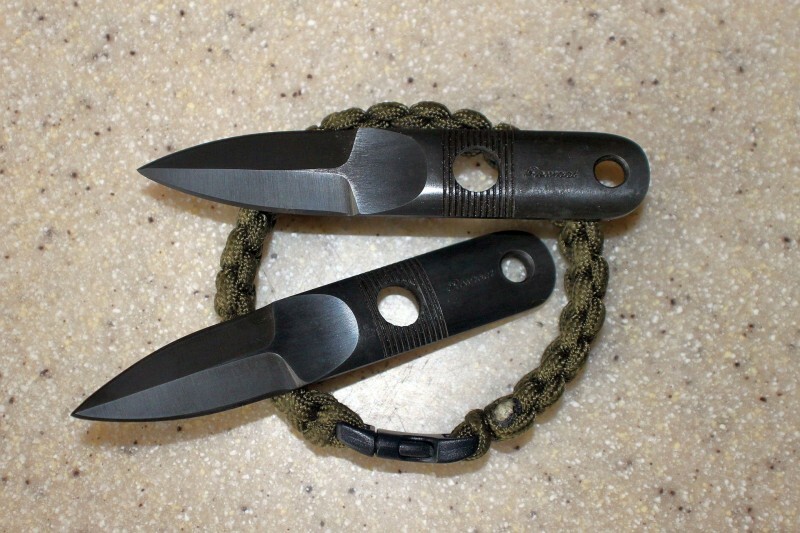 These little daggers where sewn into shirts, flight jackets, boots, and any other place that was possible. They where a last ditch weapon that was hard to detect but one that could do lots of damage in the right hands. The first concealed carry weapon. I make a kydex sheath that can be attached anywhere or hung around your neck. 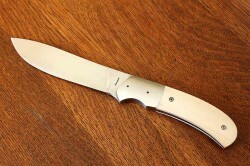 Blade length is 1 3/4 and it is 4 1/8 over all. 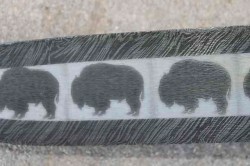 They are forged from 52100 bearings and the finish is a quick etch in ferric cloride to take the glare off. 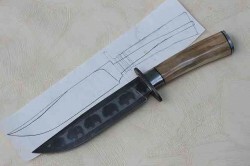 This is a small fixed blade design that I call “Toad”. 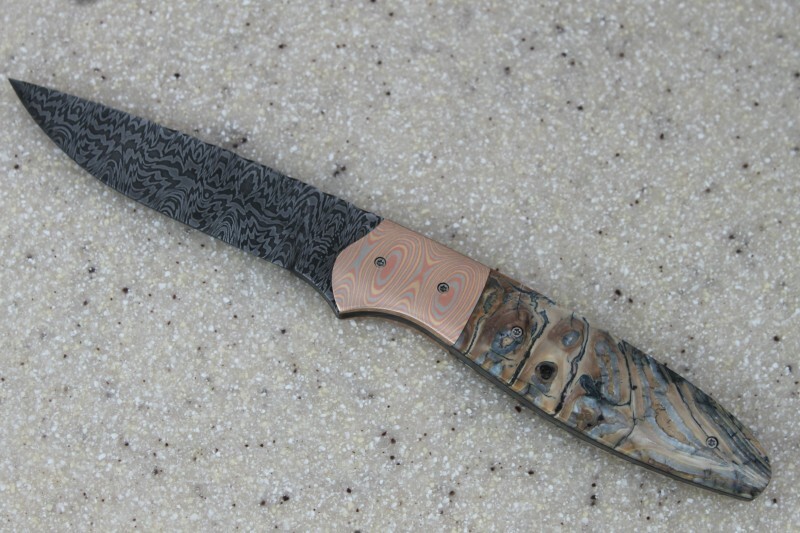 I just finished it using the Mokume Gane that I made at the ABANA conference in Rapid City. I used 40 layers of Copper, 20 layers of nickle silver, and 20 layers of Red brass. 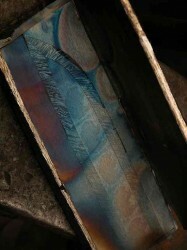 The copper was put between every layer of the brass and nickel silver. I think it turned out very striking. 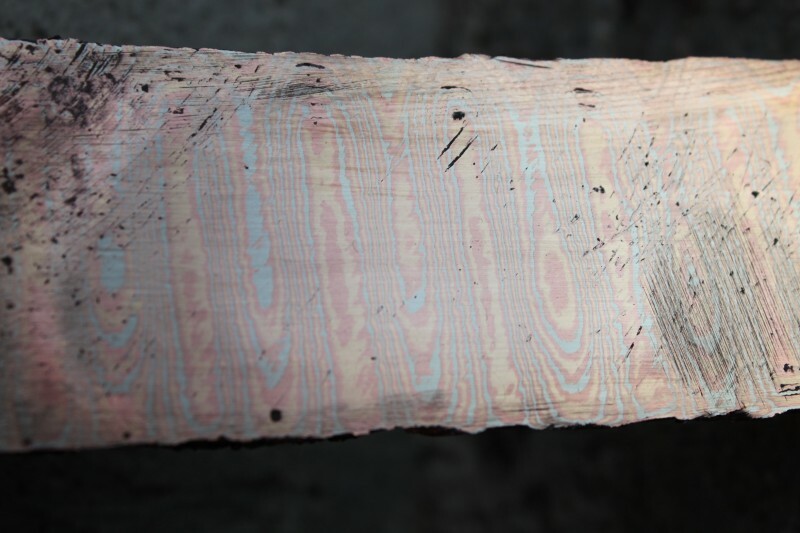 I ran it through a ladder pattern die to bring the layers to the surface. 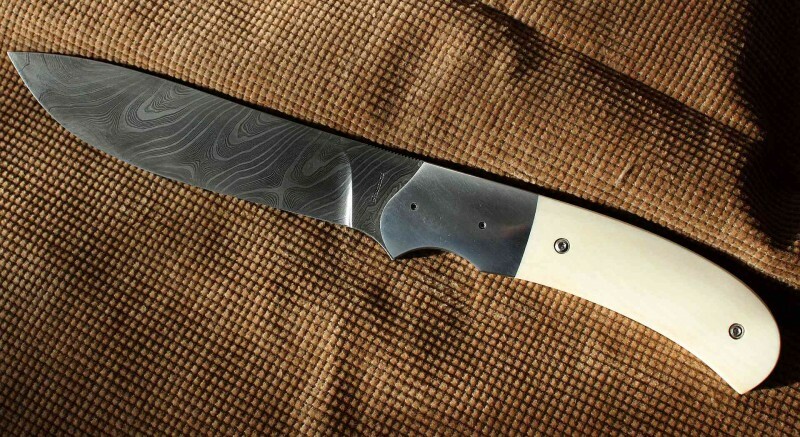 The blade is what I call Teton damascus or a laddered W’s pattern. The handle is Mammoth tooth and it is all put together with 0-80 tork head screws so I could finish the knife then take it apart and etch the hole knife so the damascus shows around the handle. It also has dovetailed bolsters and a tapered tang. Any questions or comments let me know. 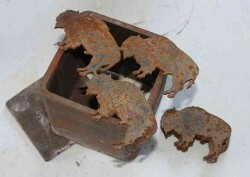 The Buffalo where waterjet cut from High carbon steel and stacked inside a 4″ piece of 1/4″ wall square tube, Nickel powder was them poured into the tube and caps where welded on the ends. The tiles where ground to the shape that I wanted the bowie to be. 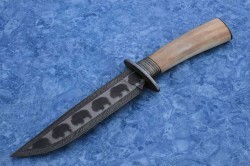 I then forged a w’s twist to 3/8″ that will become the wrap around the buffalo. The top will represent lightning and the bottom prairie grass. The cover was installed, then arc welded all the way around. Note the bolt threaded into the cover. This was removed and the billet was soaked in diesel, then the bolt was put back in before putting it into the forge for dry welding. This is how it looks after welding. Nice and clean and perfect welds. Though it is alot of work I think it gives a super strong weld. 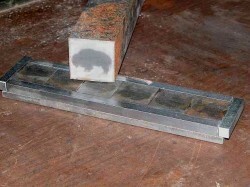 The frame had to be band sawed away from the blade and ground to shape. 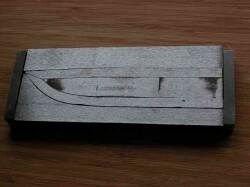 A closeup of the finished blade after welding. It was cleaned up a little and a light etch was applied. I miss a lot of steps here but this is the pieces that will make up the Lightning Strike Bowie. 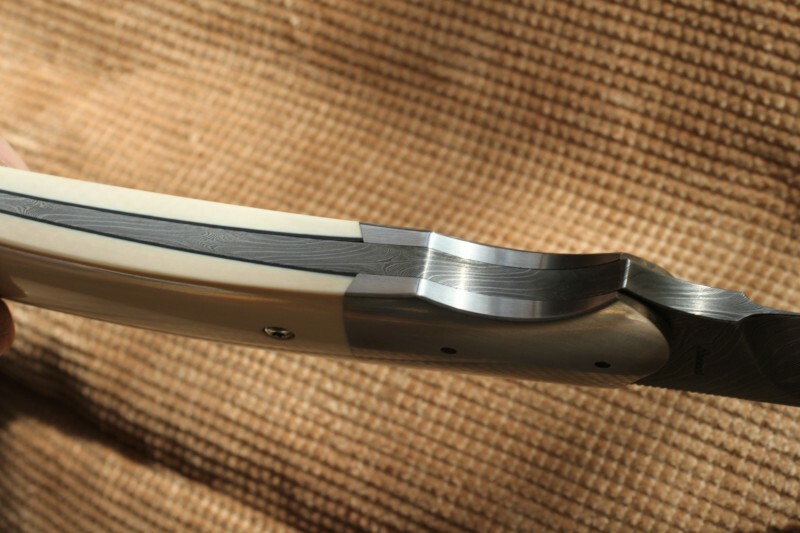 All w’s twist damascus fitting, some gold anodized titanium spacers and a Walrus ivory handle. 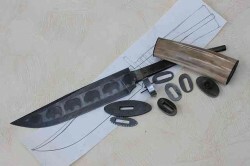 Here it is assembled, the blade needs etched and the ferrals need fileworked and etched. I will be finishing it up in the next couple day and will post a photo of the completed Bowie. I will be taking it to the ABS show in San Antonio TX in a couple week.